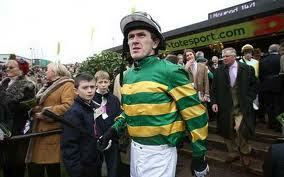 Antrim-born jockey Tony McCoy has been named Britain's sportsman of the year by the BBC. It is a fitting reward for the redoubtable McCoy who finally won the English Grand National this year, adding to every other major race in the calendar. "I am dazed," said the 36-year-old. "It's just not something you think is ever going to happen in your life. I looked in front of me and, I can't even think of the names there was so many of them. They're just, they're people you watch on television. To be standing in front of them holding such a prestigious trophy is a very surreal feeling." By most experts opinion he is the greatest jump jockey in the history of the game with a reputation of never giving up on a horse no matter how hopeless the situation looks. McCoy has been champion jockey an incredible 15 times in Britain and becomes the first jockey to ever win the coveted trophy. Instead, fifteen-times darts champion Phil Taylor finished runner-up in the prestigious awards ceremony, while endurance athlete Jessica Ennis was third.